What Are the Laws about Drinking & Boating? Who Answers? Who answers the helpline calls. Call American Addiction Centers to find help with alcoholic rehab. Boating is a fun recreational activity that is often combined with drinking and partying. All 50 states have laws regarding alcohol consumption and boat operation. 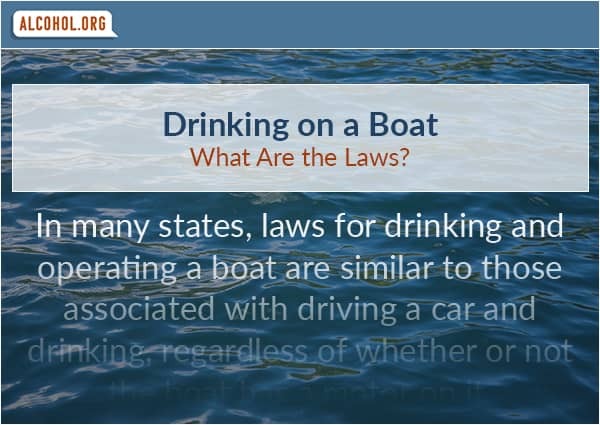 In many states, laws for drinking and operating a boat are similar to those associated with driving a car and drinking, regardless of whether or not the boat has a motor on it. The legal limit for drinking and driving is a blood alcohol concentration (BAC) of 0.08% g/dL, and the same is true for operating a boat. This applies to any boat, including a canoe, kayak, or rowboat. Legal BAC limits generally apply to those of legal drinking age, or individuals who are 21 or older. Underage drinkers may be penalized more stiffly, and many states have zero-tolerance laws for boating and drinking any amount of alcohol. In states, like Florida for instance, the Boat-ed Florida Handbook publishes that by operating a vessel in the state's waters, a person gives consent to be tested for the presence of alcohol and/or drugs if a peace officer requests it. Refusing to be tested can lead to additional penalties. Boating under the influence (BUI) laws vary from state to state in regard to the penalties inflicted. However, it is considered illegal to operate a boat while intoxicated in every US state. Boating can be potentially even more hazardous than operating a motor vehicle, especially when faculties are impaired by alcohol. A person has to be aware of tides, currents, things that may not be visible under the water, other boaters, people or objects in the water, and weather. There are no roads or lines on the water telling boaters where they can and can't drive. The American Boating Association publishes that in 2016, there were nearly 4,500 boating accidents and over 700 deaths. In fatal boating accidents, alcohol is the number one contributor, and it was the primary factor in 15 percent of boating fatalities in 2016. The Coast Guard warns that people who have a BAC of 0.10% or higher are 10 times more apt to be killed in a boating accident than boat operators who are sober. The combination of the sun and the water may cause alcohol to have a greater effect on someone while they are boating. While a person may typically be able to have a few drinks over a period of time and not be significantly impaired, the same number of drinks in the same amount of time on a boat may lead to greater impairment. Drink for drink, alcohol can have more influence on someone while they are boating than while they are ashore. Alcohol is a central nervous system depressant that slows down bodily functions while also lowering inhibitions, reducing decision-making capabilities, and slowing reaction time and reflexes. Alcohol can make a person sluggish, uncoordinated, and sleepy. It also disrupts balance by causing disturbances in the inner ear, which can make it more difficult for a person to know the difference between up and down, potentially a lifesaving discernment while in the water. Depth perception, focus, memory, and the ability to process information are all impaired by alcohol consumption. Alcohol interferes with a person's executive functions, which can make someone more impulsive and prone to take bigger risks without regard for the consequences. It can also cause a person to overestimate their own abilities. For instance, someone under the influence of alcohol may think they are a better swimmer than they are, and may push themselves too hard while drinking. Alcohol can distort body temperature, which may lead to the onset of hypothermia while in cold water for too long. These cognitive, physical, and emotional changes caused in the brain and body by alcohol can be especially dangerous when a person is on the water, and even more so when they are in charge of operating a boat. Drinking and boating can increase the odds for drowning, falling off the boat into the water, and driving recklessly. This increases the risk of injury to the people on board and others in the area, as well as the risk of damage to the boat. Even if the boat is anchored, excessive alcohol consumption can be risky while on the water for all of these reasons. Not only can alcohol make it more likely that a person will make unsafe and possibly hazardous choices, it also makes it more difficult to recover from these decisions, which can be fatal when in or on the water. Can You Get A DUI on a Bicycle? Learn how by calling us today. Who Answers?Who answers the helpline calls. Alcohol and boating can be a dangerous combination, and boat operators can face serious consequences for drinking and boating. State, local, or federal officials; the Coast Guard, sheriffs; park rangers; fish and game wardens; and other members of law enforcement often patrol the waterways checking for boaters who may be driving erratically, who pose a possible threat or danger to themselves or others, or who appear to be under the influence of drugs and/or alcohol. All of these law enforcement officers carry chemical testing materials to check an individual's BAC level in order to determine whether or not they are intoxicated. In some cases, such as the appearance of being impaired and the presence of alcohol, even if the BAC level is under 0.08% g/dL, a person may still be charged, arrested, fined, or otherwise penalized. The voyage is terminated after a BUI incident. A non-drinking member of the boating party may be able to drive the boat to shore in the case of a BUI; however, law enforcement officials may board and impound the boat instead. While alcohol consumption is not illegal while boating, boat operators should be aware of the laws and potential penalties for operating the vessel while under the influence. To be safe, boat operators should generally stick to the same guidelines that apply to alcohol consumption and driving a car. Just like with driving a motor vehicle on land, there is technically no safe amount of alcohol that someone can drink and then operate a boat. Drinking and boating is a practice that is best to be avoided. Alcohol impacts everyone differently, and being out on the water in the sun may lead to even more variables and complications. Boaters should pack lots of water and other non-alcoholic beverages to enjoy while out on the water. It is important to stay hydrated while being in the sun for any length of time, and being on the water can make this even more essential, especially if there is any amount of alcohol being consumed. Wear a floatation device or life jacket while on a boat, and plan out the trip ahead of time. Consider that being on the water and out in the sun all day can be tiring, and plan to head in before fatigue sets in. In general, a person who is of legal drinking age can usually drink responsibly by sticking to a drink or two over a period of a few hours. A standard "drink," as defined by the National Institute on Alcohol Abuse and Alcoholism (NIAAA) is one beer (12 ounces containing 5% alcohol), one glass of wine (5 ounces containing 12% alcohol), or one shot of distilled spirits (1.5 ounces of 80 proof liquor containing 40% alcohol). An adult may be able to drink responsibly when sticking to patterns of low-risk drinking, which means less than three drinks in a day for a woman and less than four drinks a day for a man. Typically, a person will bring their BAC up to dangerous levels if they consume more than two drinks in the span of an hour or two. There are many things that can influence BAC levels, including a person's metabolism, size, gender, race, what they've eaten that day, stress levels, and other biological, genetic, and environmental aspects. When someone is planning to operate a boat, however, it is best to abstain from drinking altogether, and allow plenty of time in between drinking and operating the vessel (at least one hour per drink). It is a good idea to designate a non-drinking driver before beginning a boat excursion. Everyone else on the boat should agree to drink responsibly, to ensure that everybody will stay safe while out on the water. What Is the Financial Cost? Take the quiz! Have you been drinking? Alcohol.org is an American Addiction Centers, Inc. subsidiary. Not sure what this means? Learn more about AAC. Recovery is Worth Fighting For. © Alcohol.org 2019 •et; All Rights Reserved. For those seeking addiction treatment for themselves or a loved one, the Alcohol.org helpline is a private and convenient solution. Our helpline is offered at no cost to you and with no obligation to enter into treatment. Neither Alcohol.org nor AAC receives any commission or other fee that is dependent upon which treatment provider a visitor may ultimately choose.